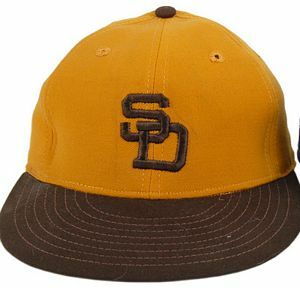 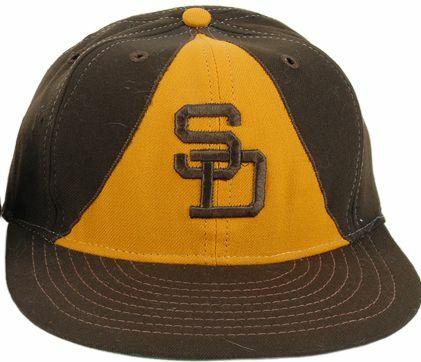 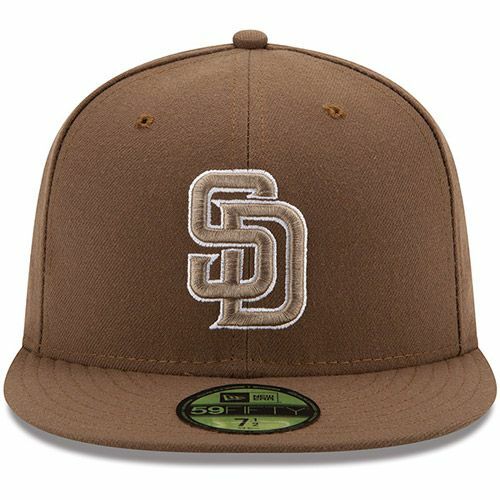 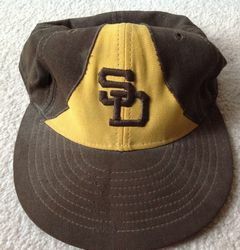 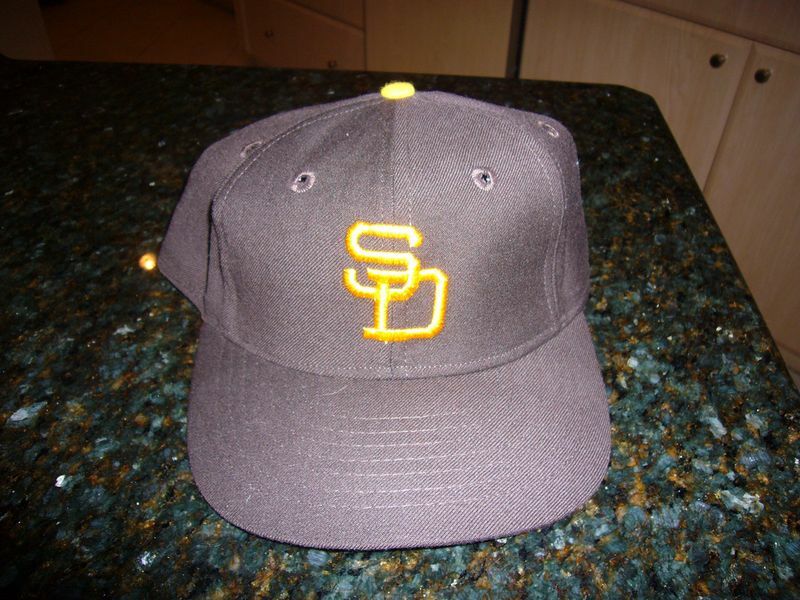 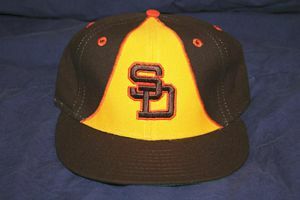 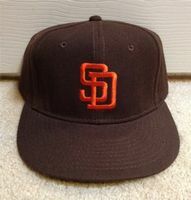 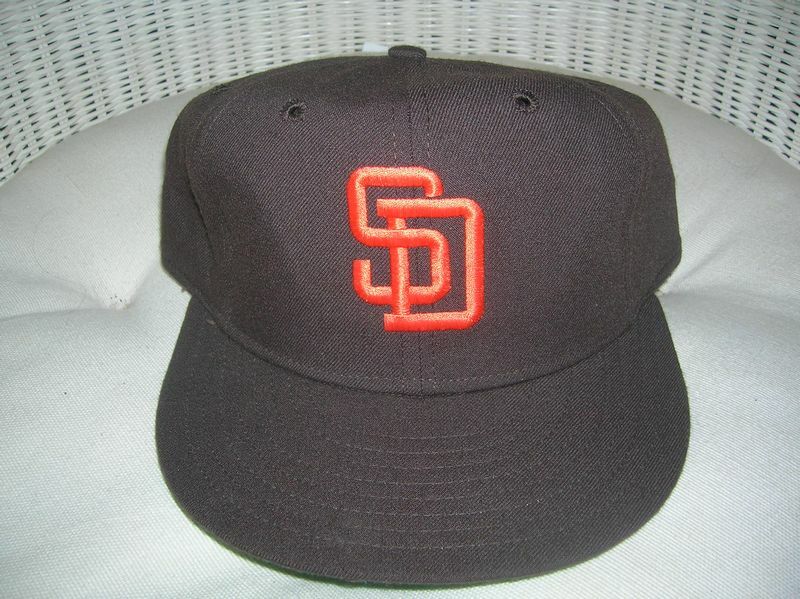 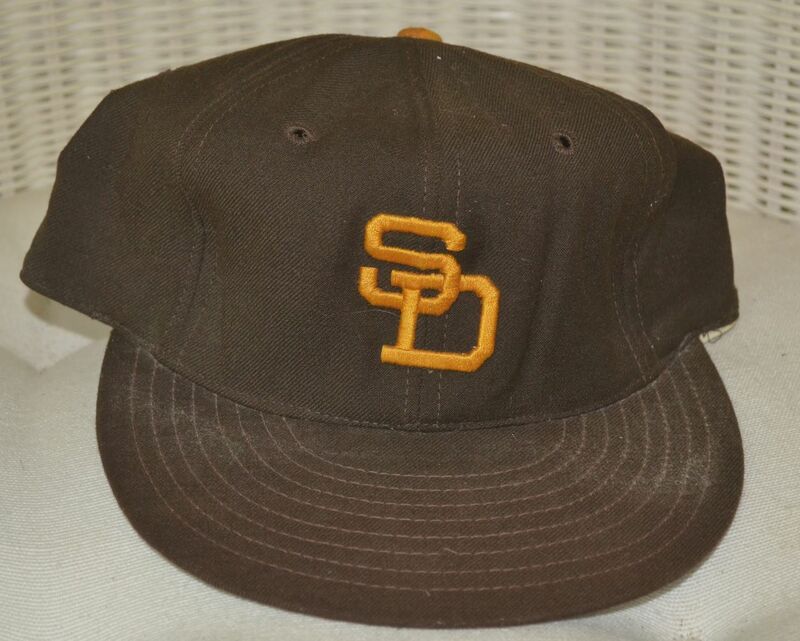 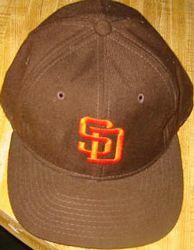 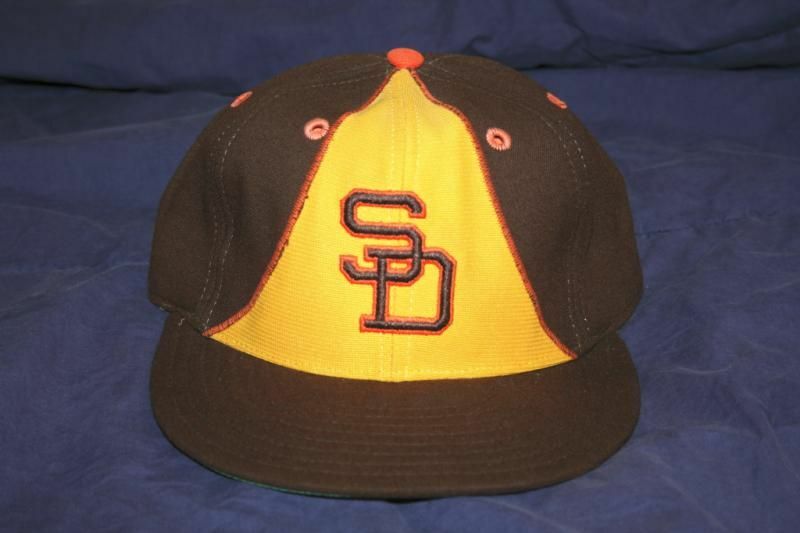 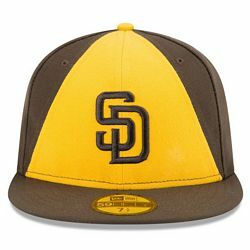 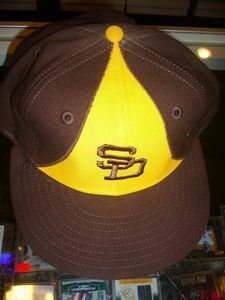 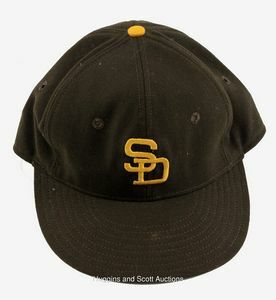 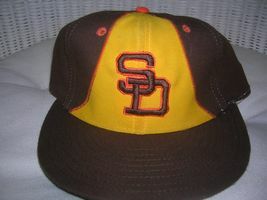 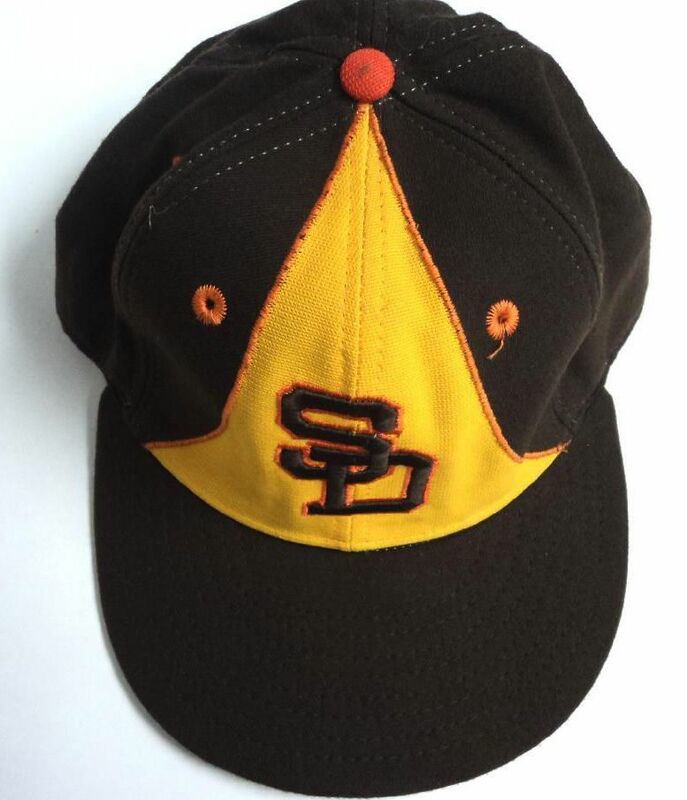 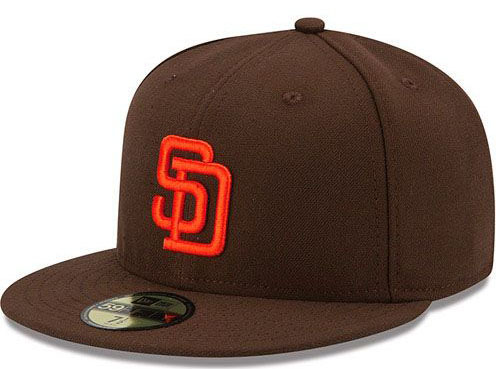 When expansion brings a team to San Diego for the 1969 season the Padres become the first to wear brown since the St. Louis Browns. 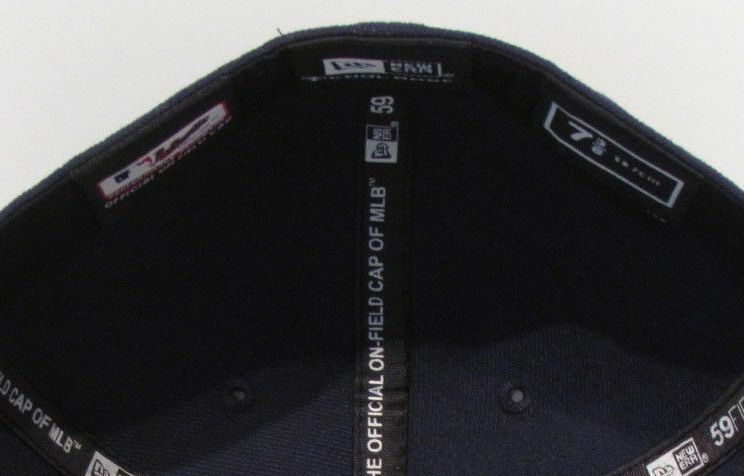 Infinite thanks to Paul Carr at the Ballcap Blog for most of this section. 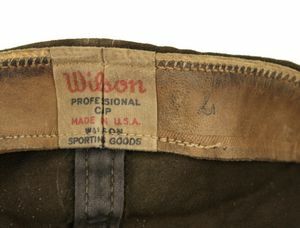 The S underlaps the top bar of the D on Wilson caps. New Era also makes caps, but with variations. The S lies on top of the D and the button is brown, not yellow. 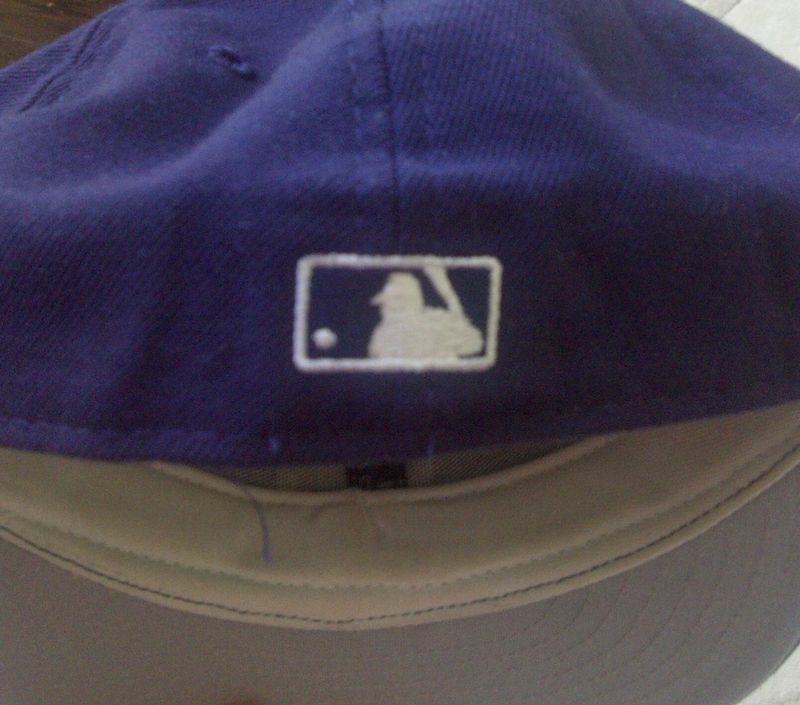 Likely not worn. 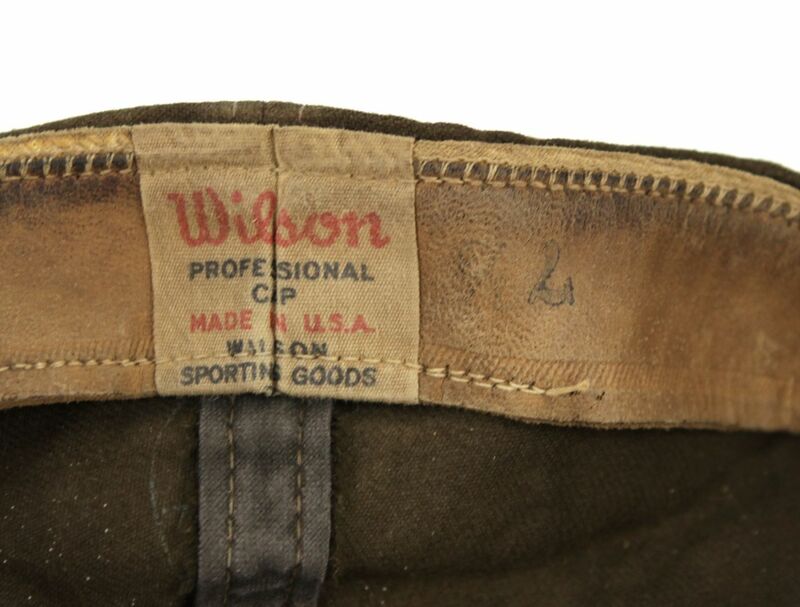 Wilson 1970 caps have the same S underlap D logo. 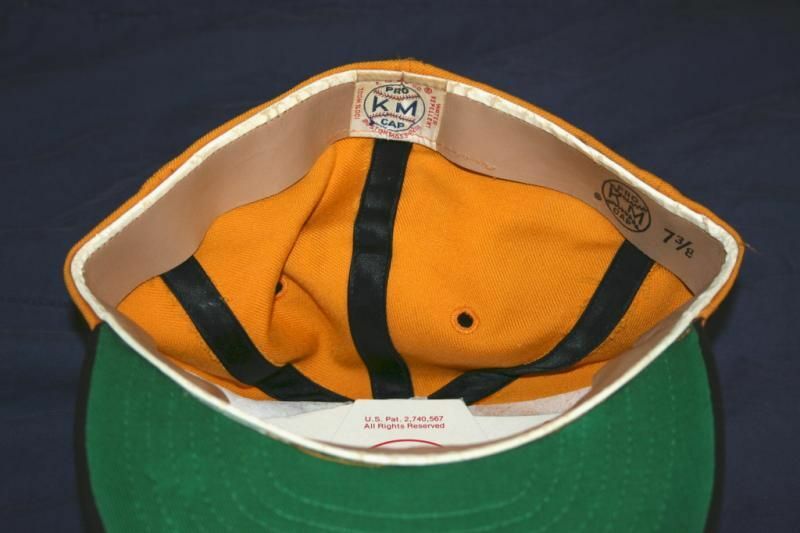 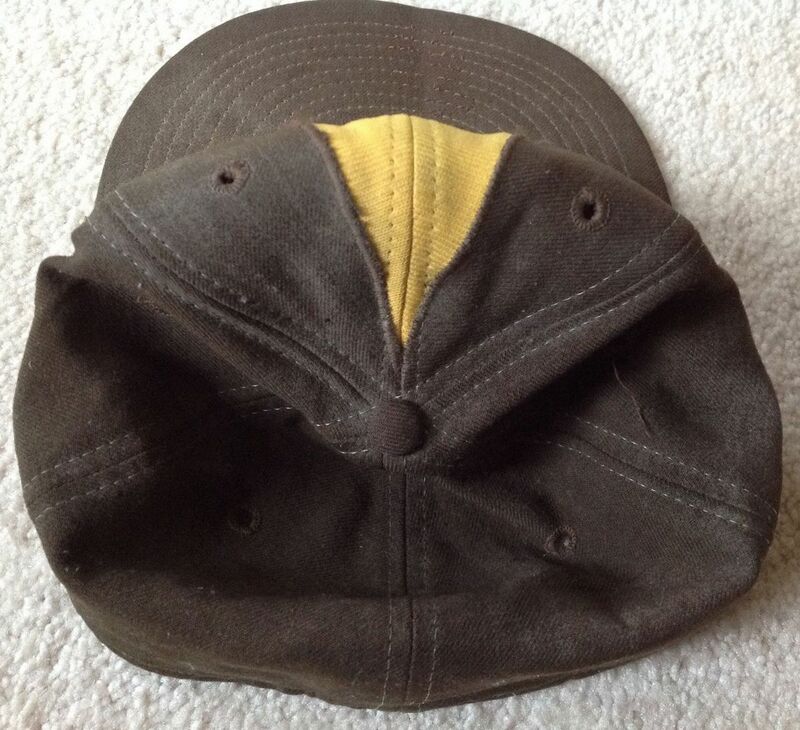 In 1971 only, the road cap is yellow. 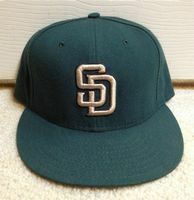 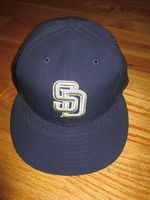 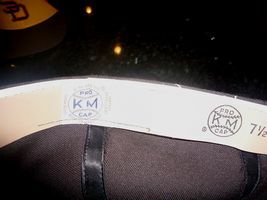 The Padres definitely wear both KM Pro and New Era caps. 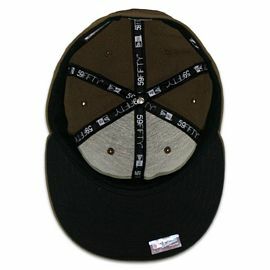 These New Era caps with an elongated logo and a serif on the "S" are in spring training pics. Not sure if they were used in the regular season. 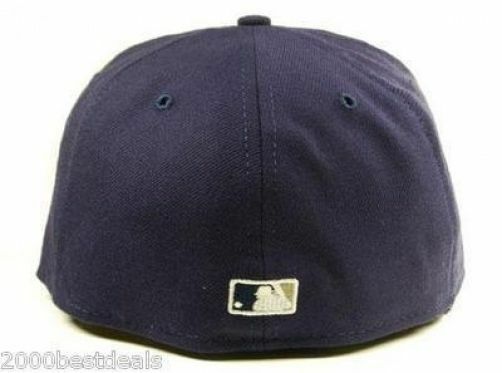 New Era gets the logo right. 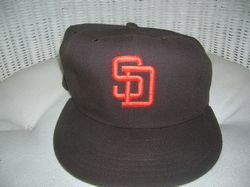 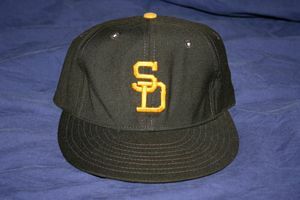 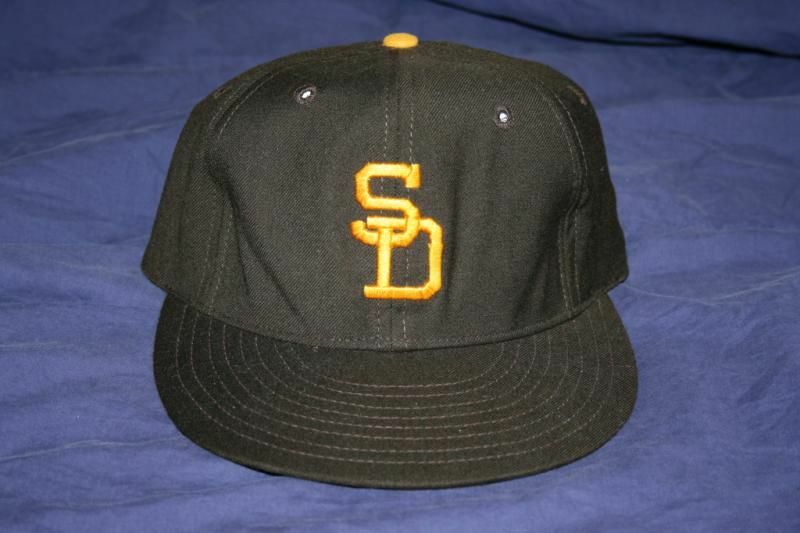 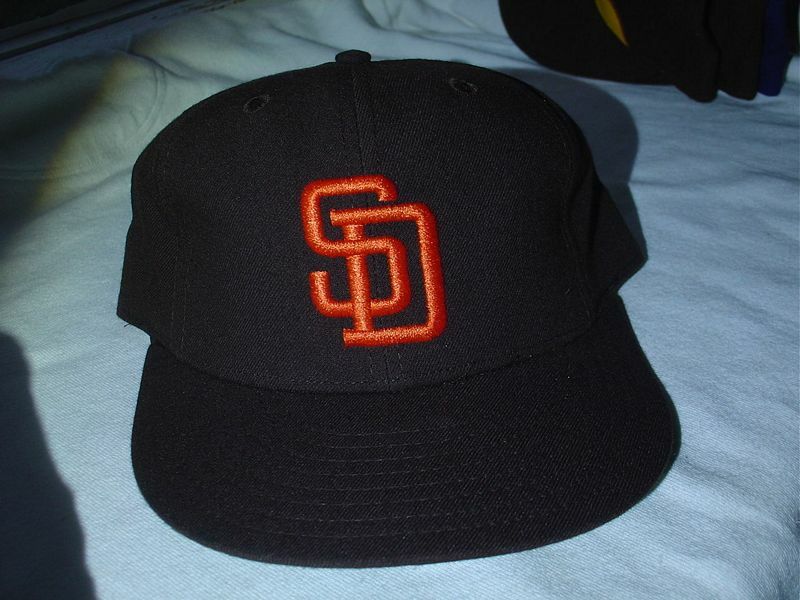 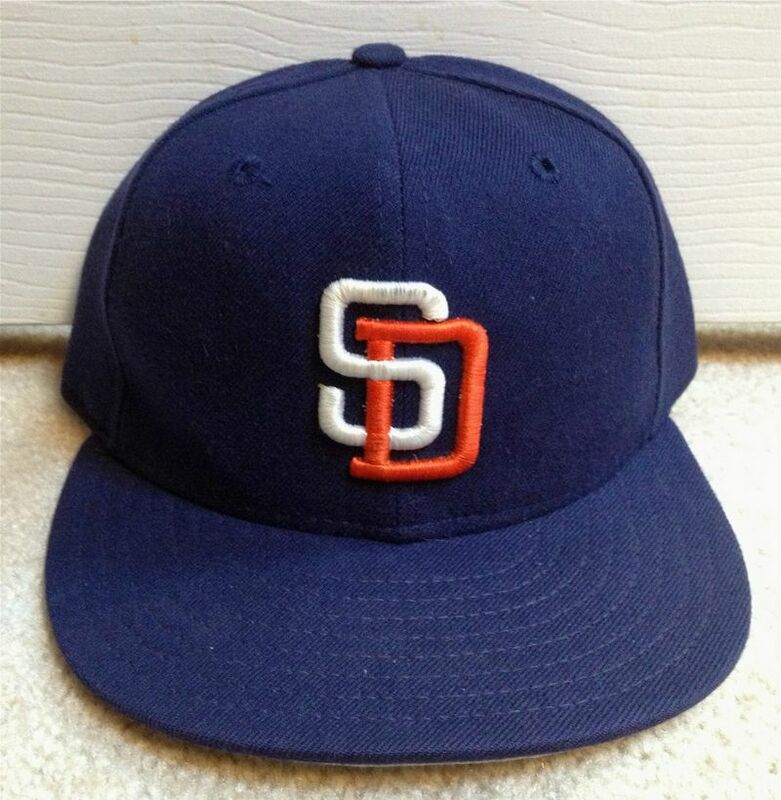 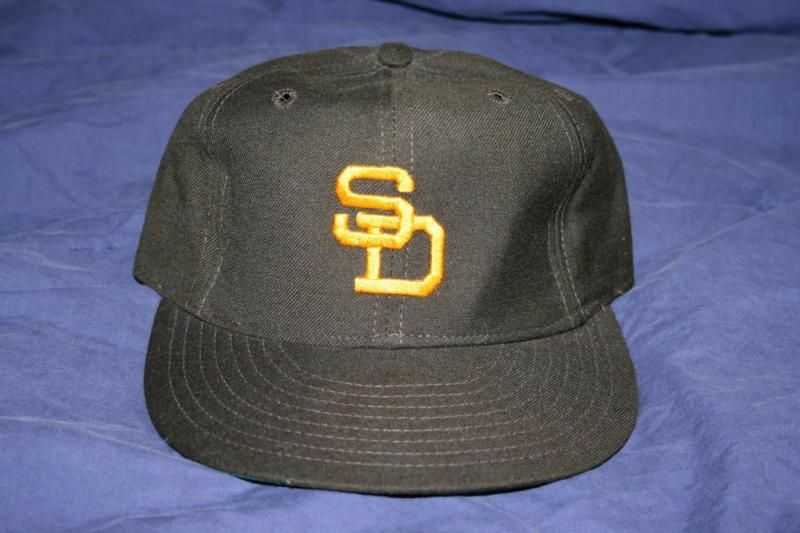 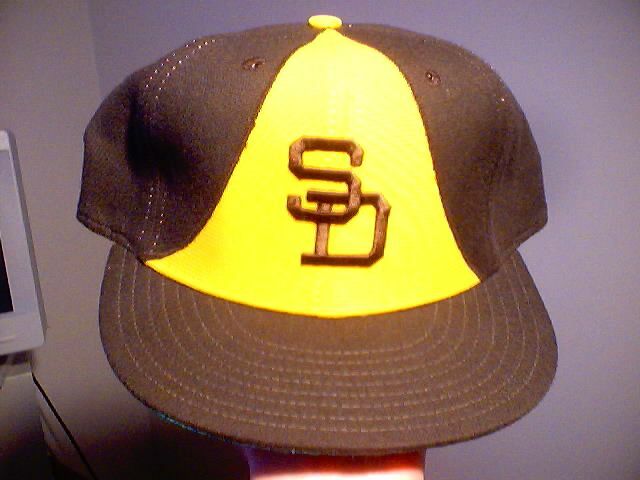 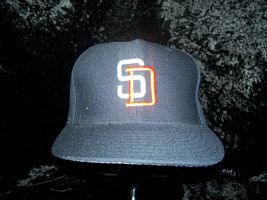 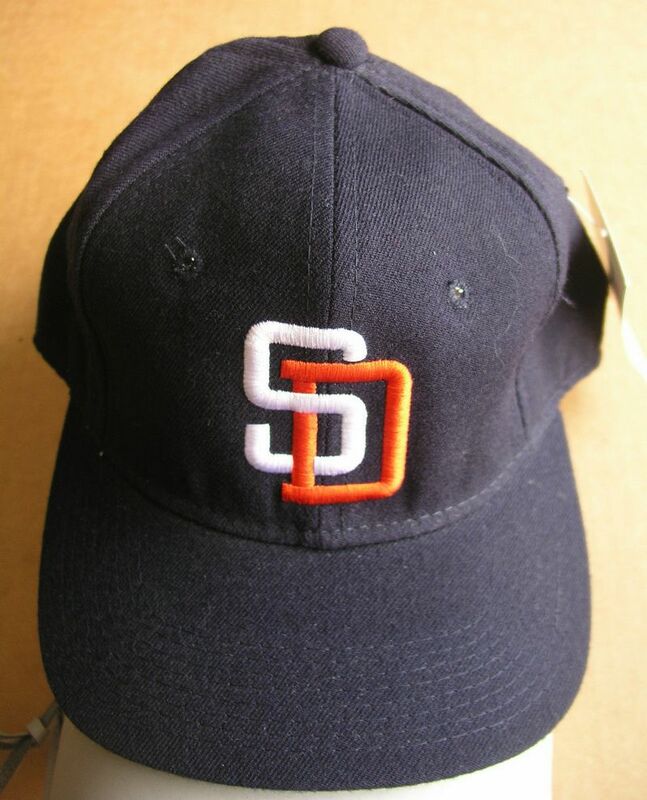 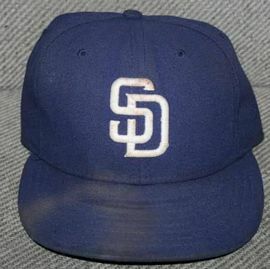 The S and D interlock with the S overlapping the top bar of the D.
In 1972 only, the first version of the "Taco Bell" is worn as a Sunday alternate. 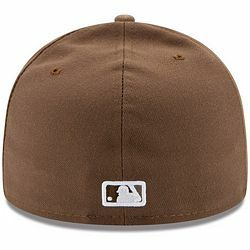 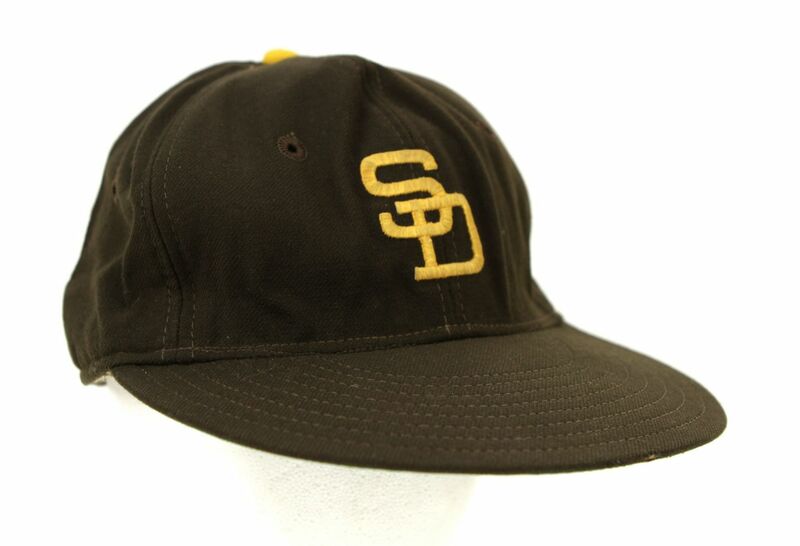 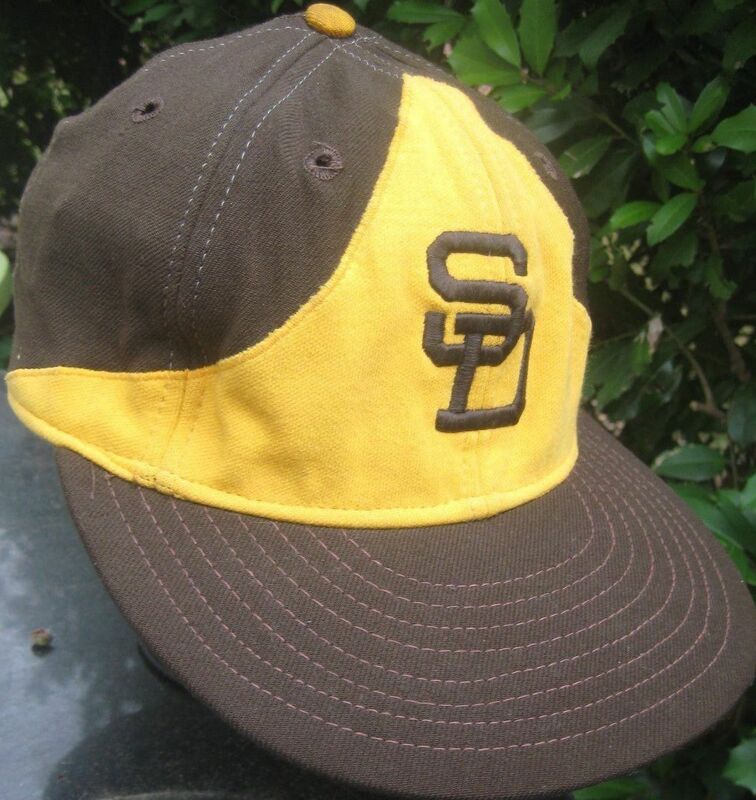 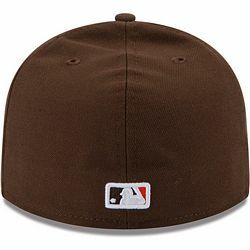 The Padres used KM Pro brown caps in 1972, but again, I'm not certain if they used New Era brown caps in 1972. 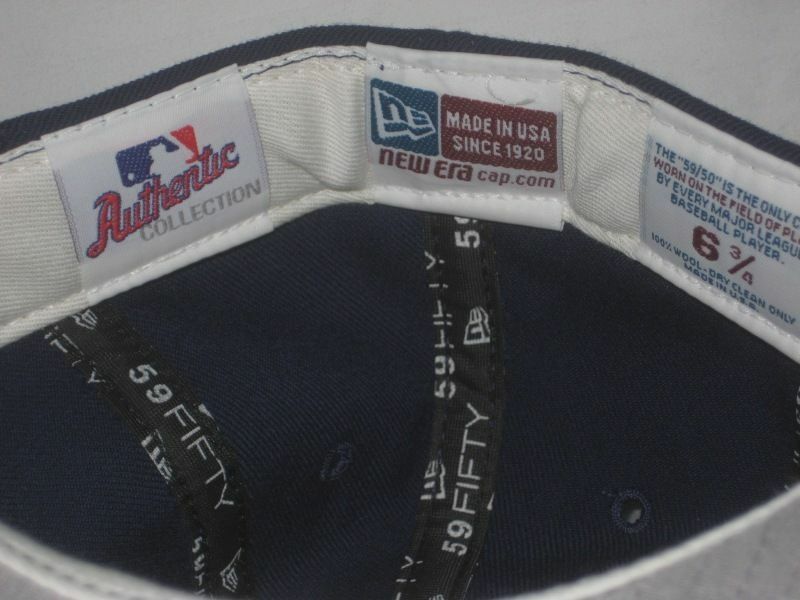 But New Era did make the alternate. 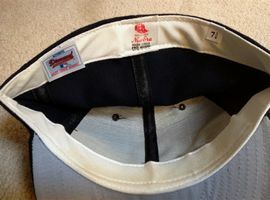 Taco Bell time! 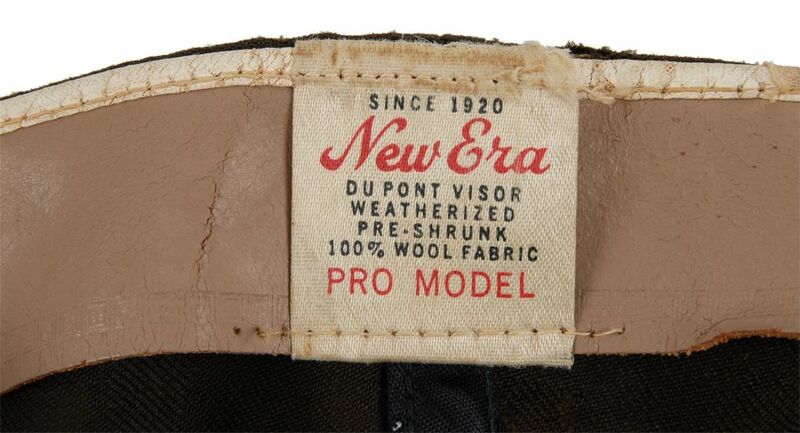 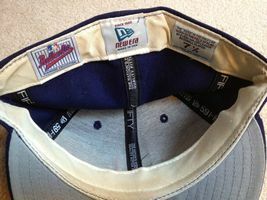 A great history of these caps is found at the Ballcap Blog. 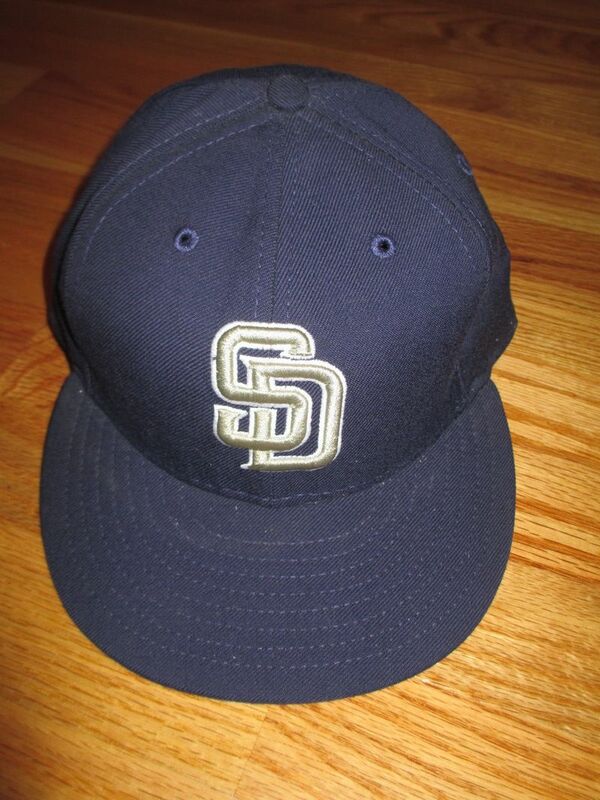 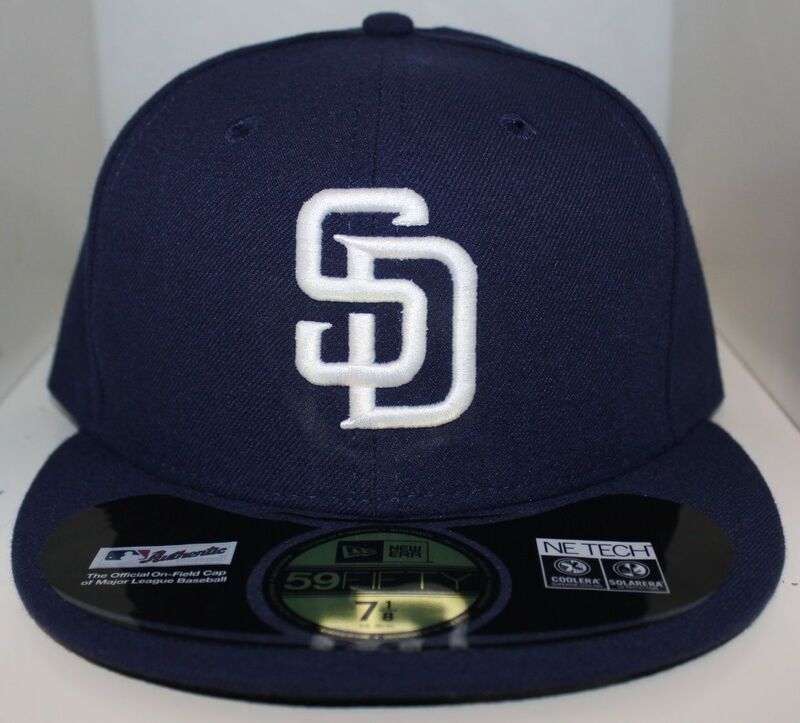 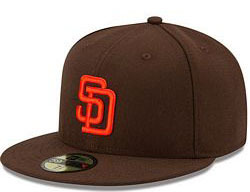 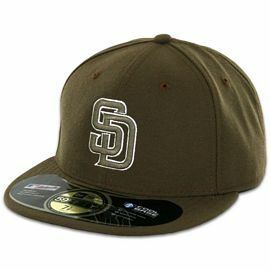 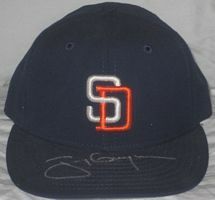 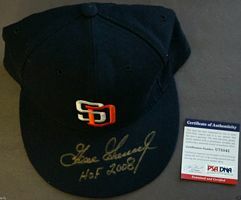 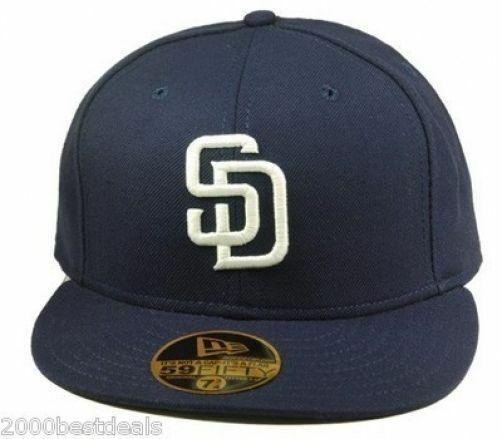 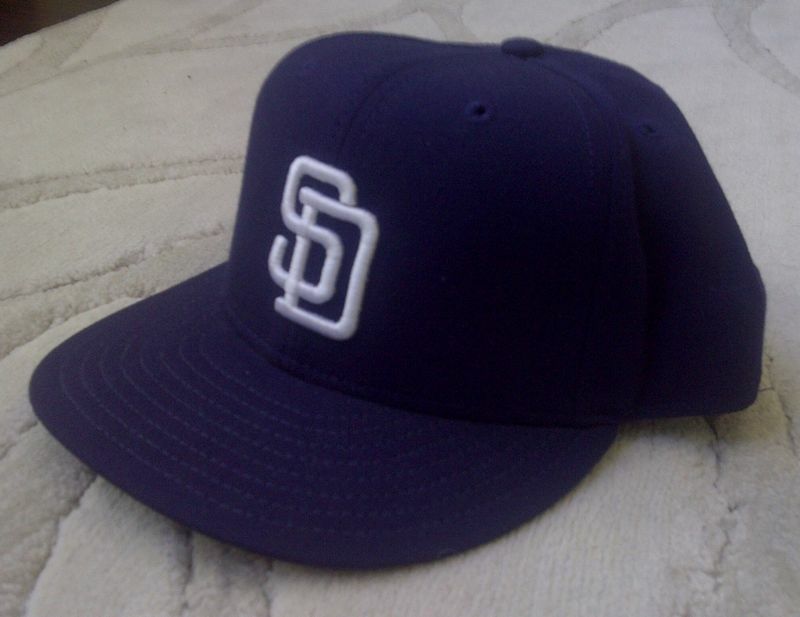 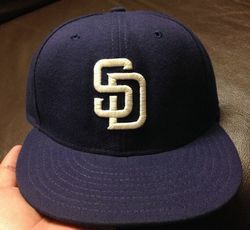 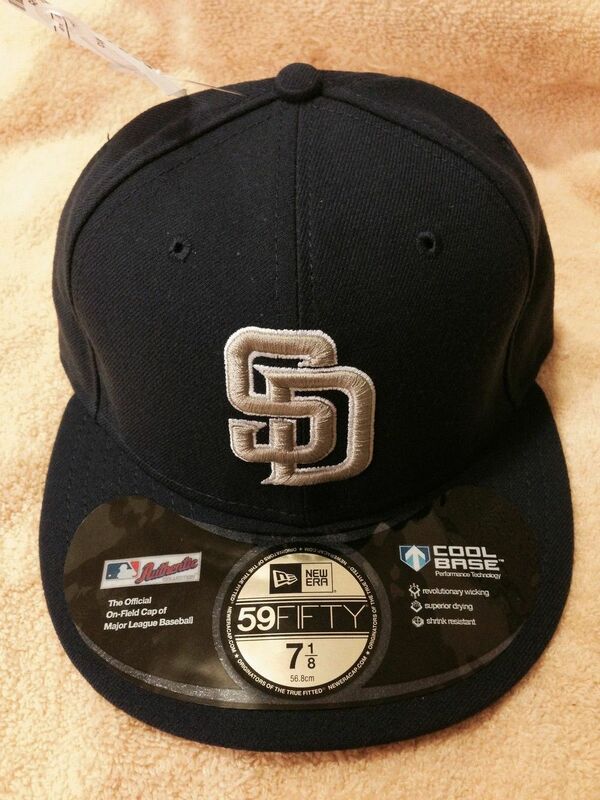 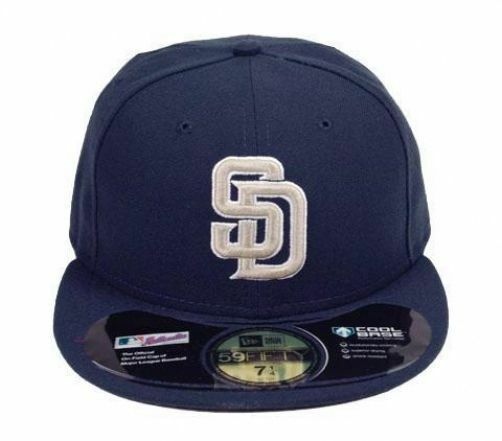 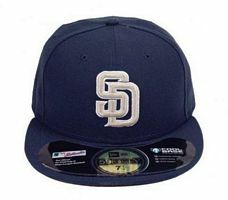 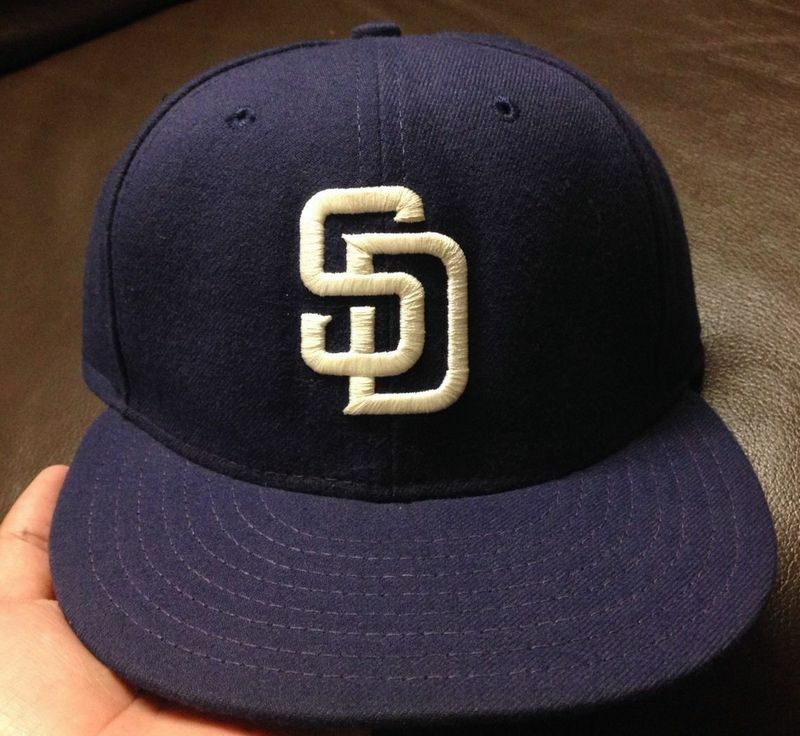 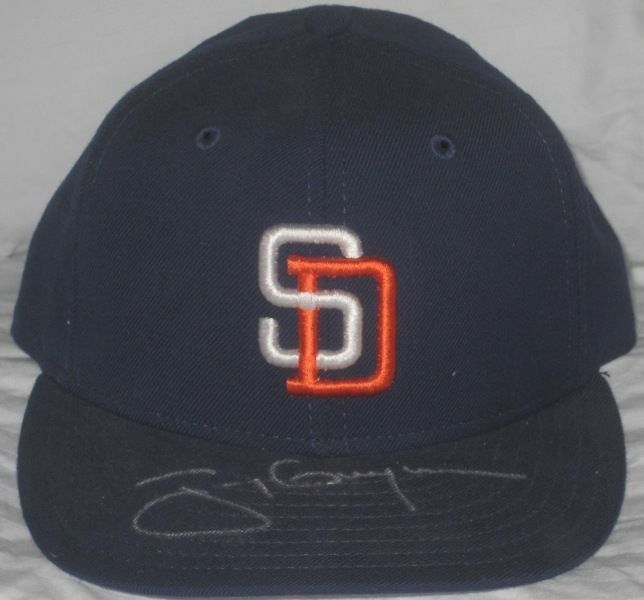 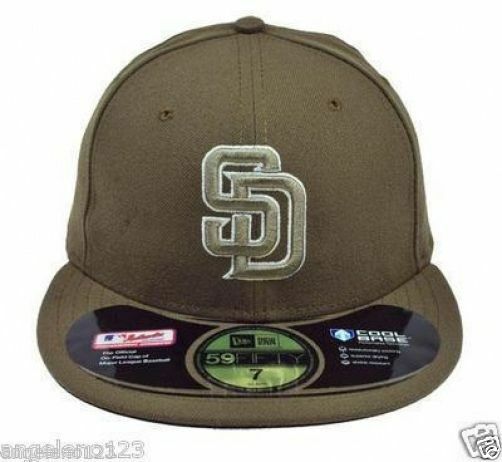 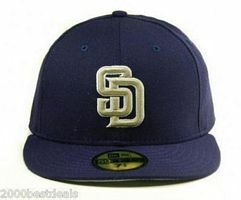 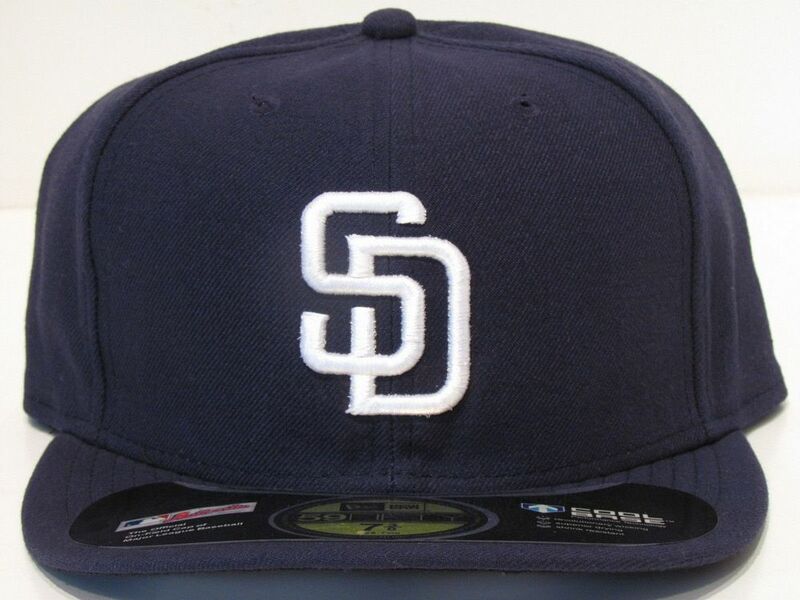 The Padres now use New Era exclusively. 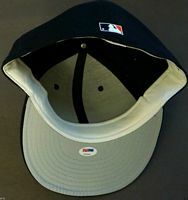 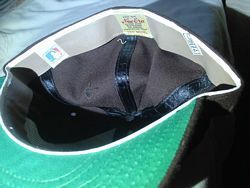 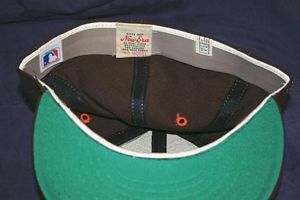 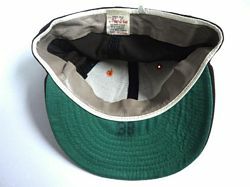 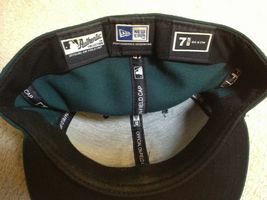 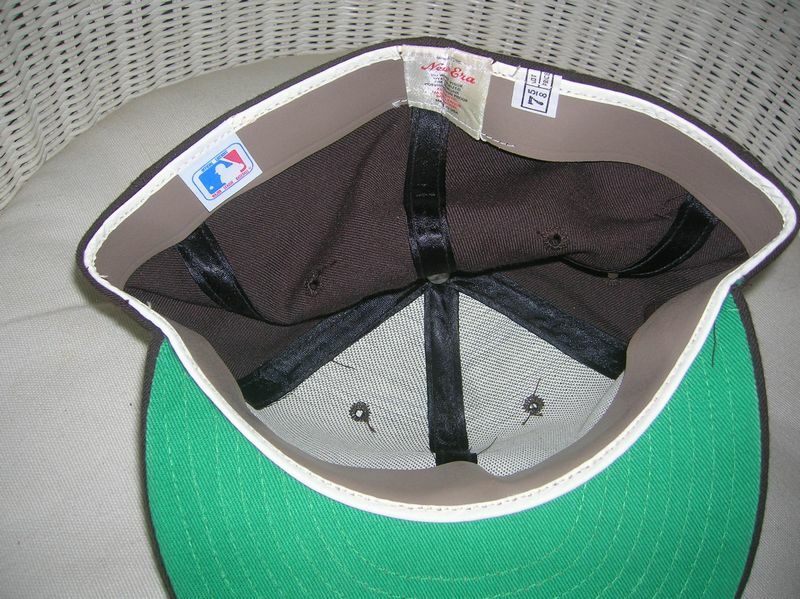 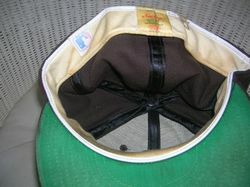 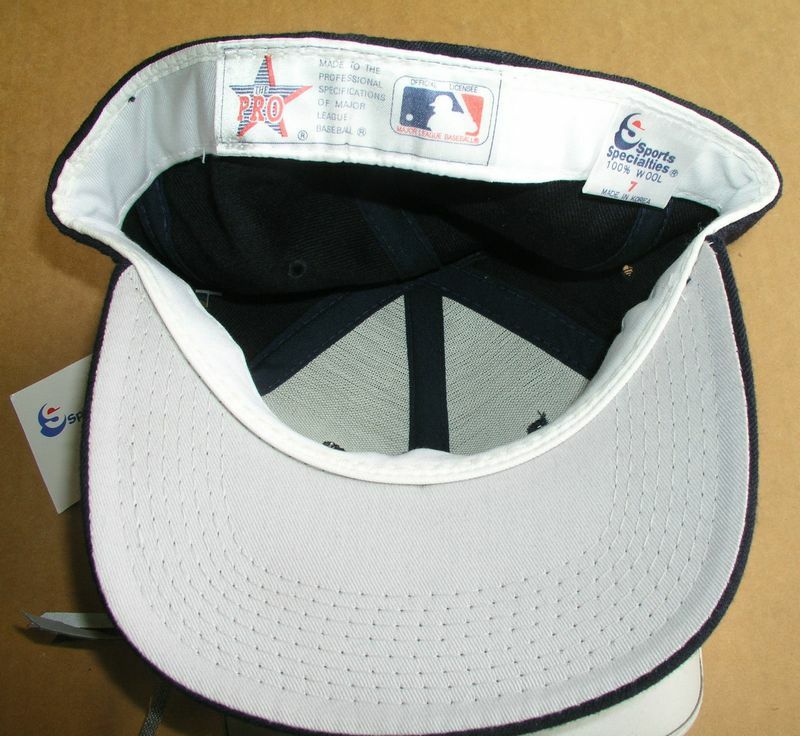 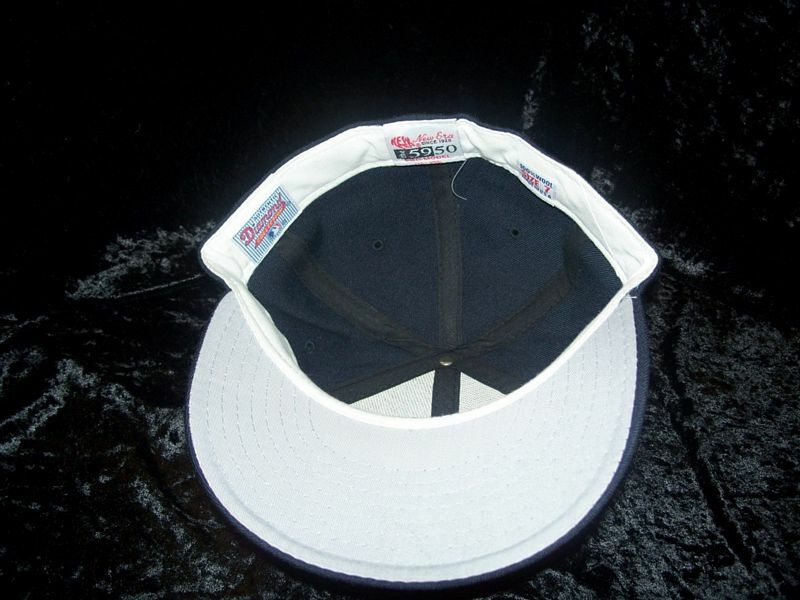 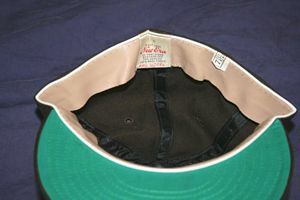 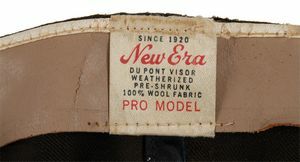 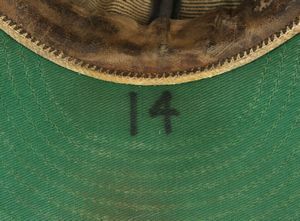 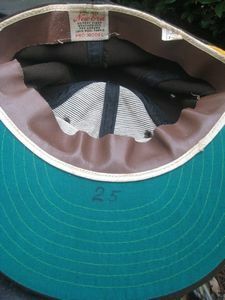 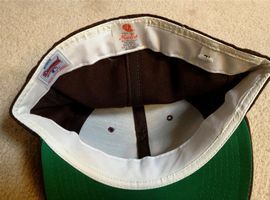 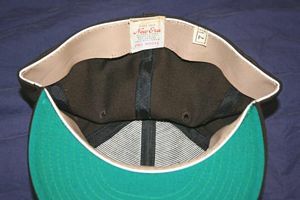 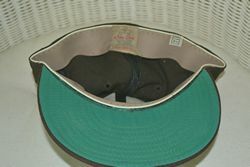 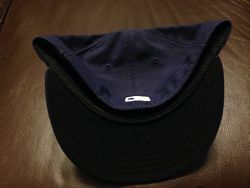 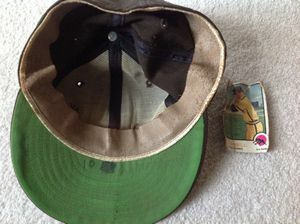 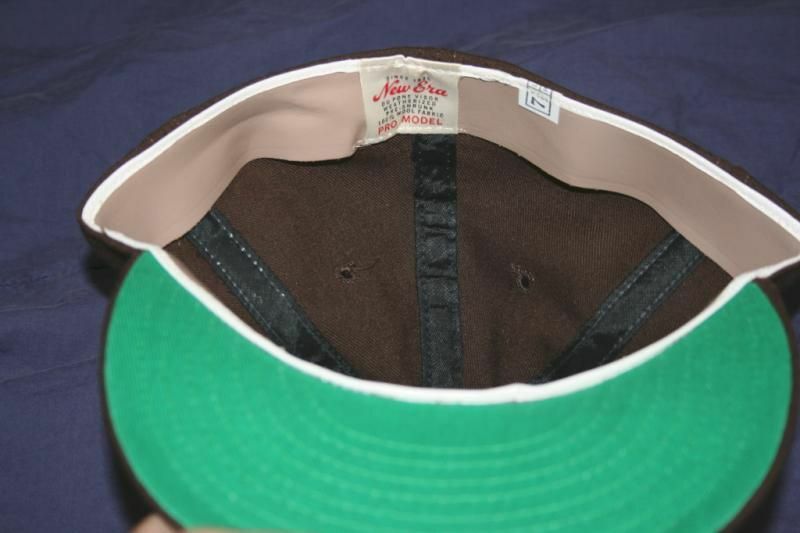 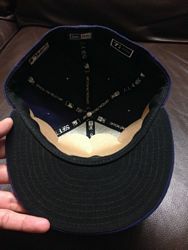 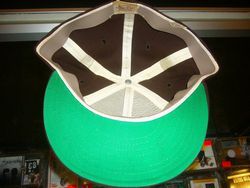 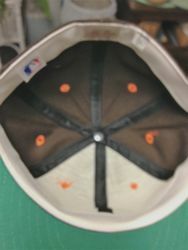 Front panels of on-field caps are nylon. 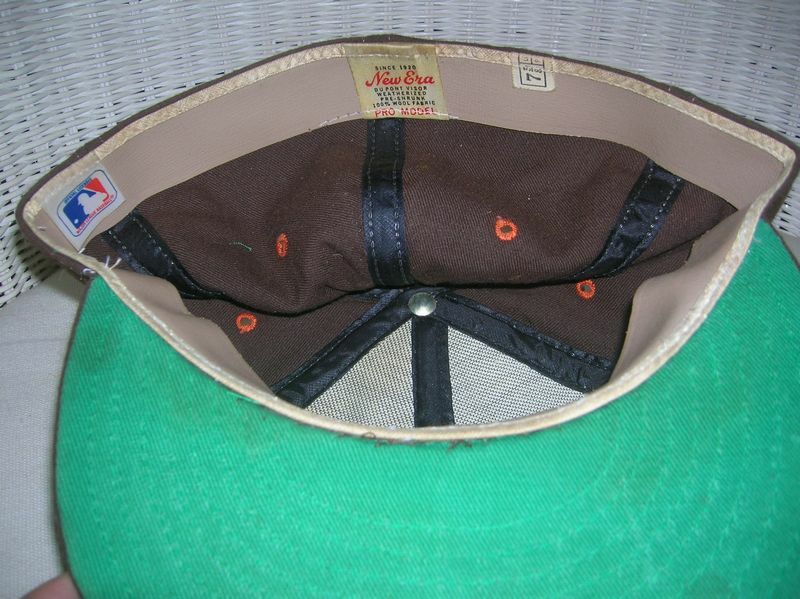 Buttons are brown, at least at the start of 1973. 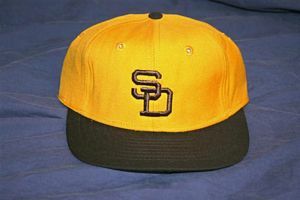 Buttons change to yellow some time in 1973. 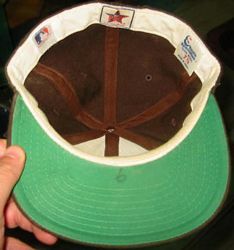 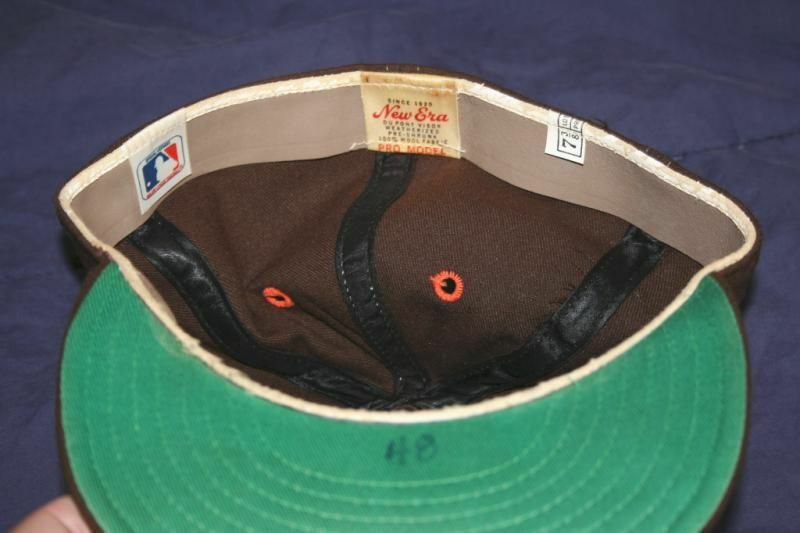 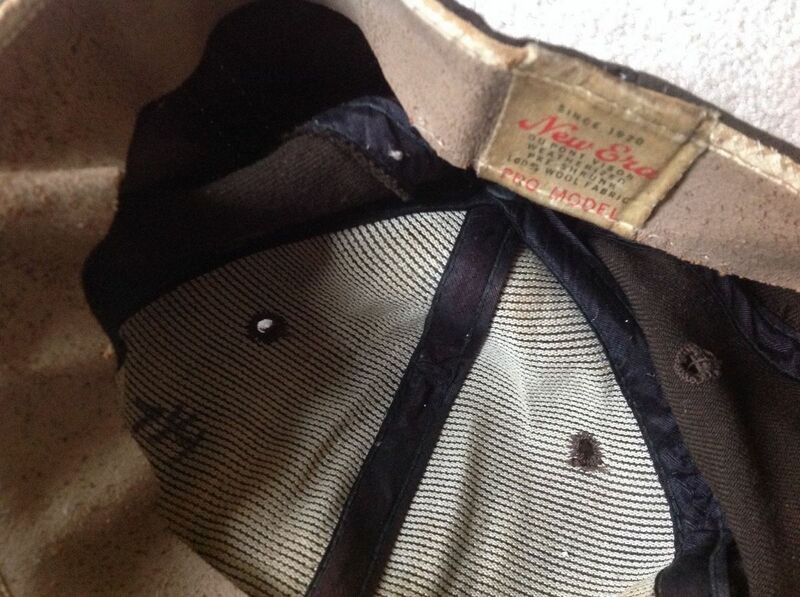 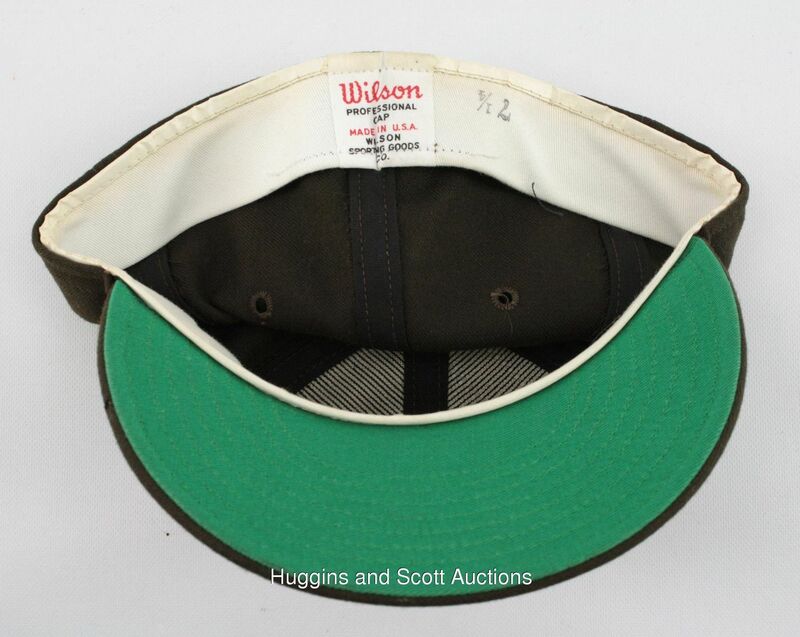 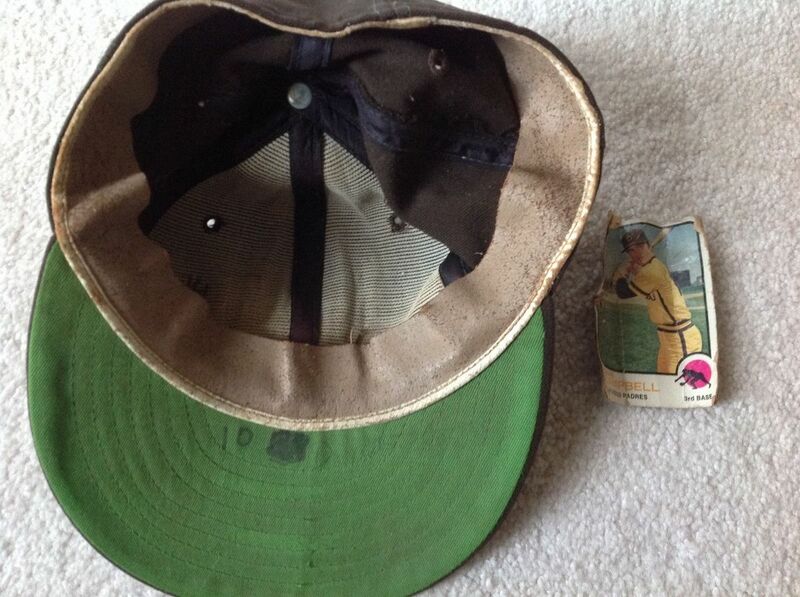 This cap, apparently from manager Don Zimmer, has a cloth front panel which was commonly sold at retail. Some caps had overlapping instead of interlocking logos - probably a manufacturing mistake as was comon at the time. Not sure if these made it onto the field. 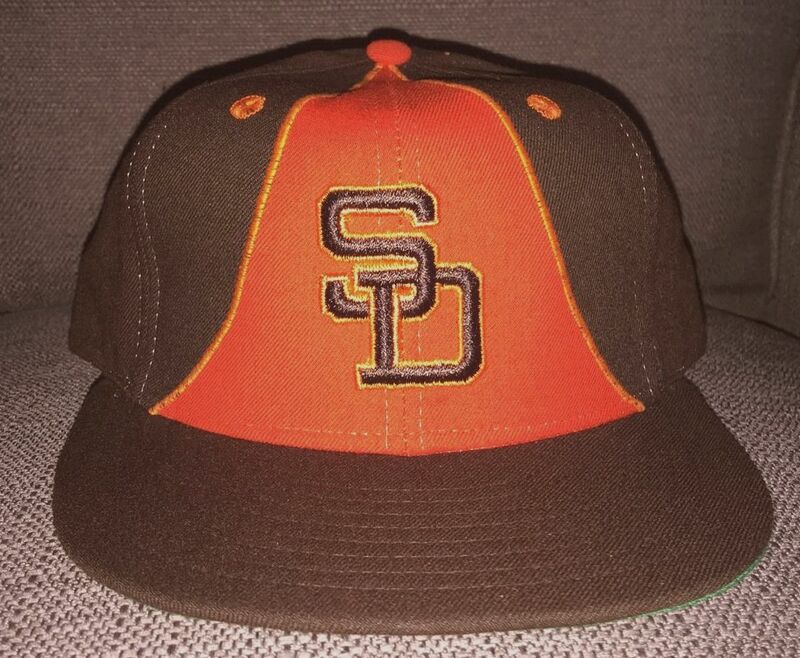 Orange is added to the colorway. 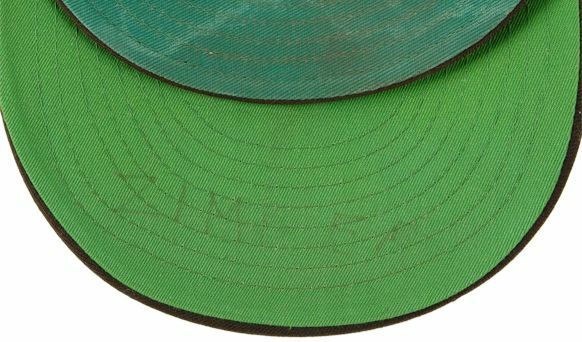 MLB tags start to appear inside caps in 1981. 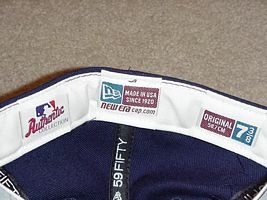 Note - Sports Specialties and Roman Pro taco bell versions exist - THEY WERE NOT USED ON FIELD. Sometime in the early to mid 80's the team contemplates a cap style change, but doesn't follow through. 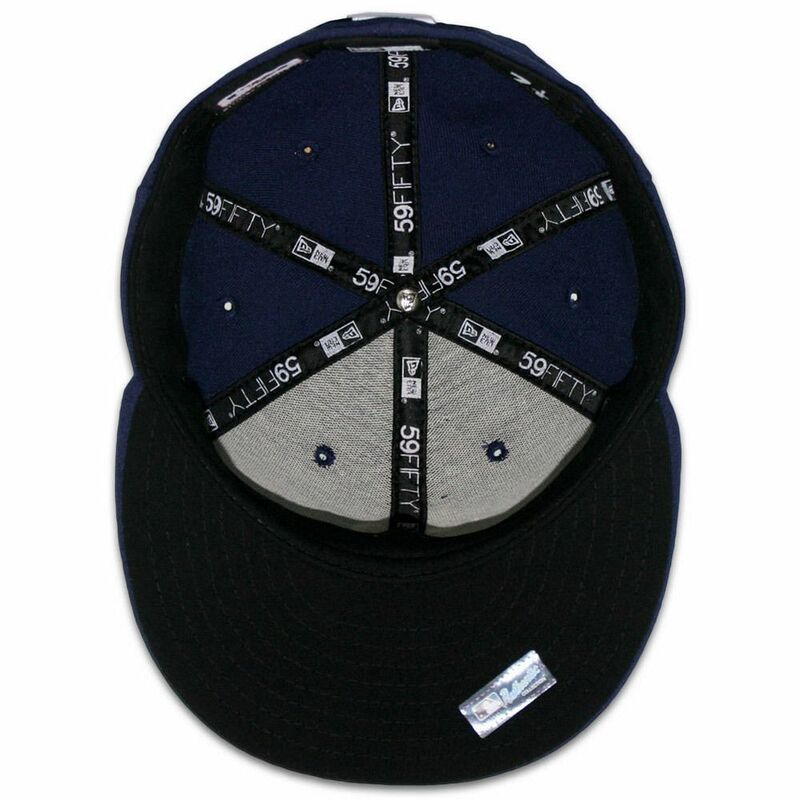 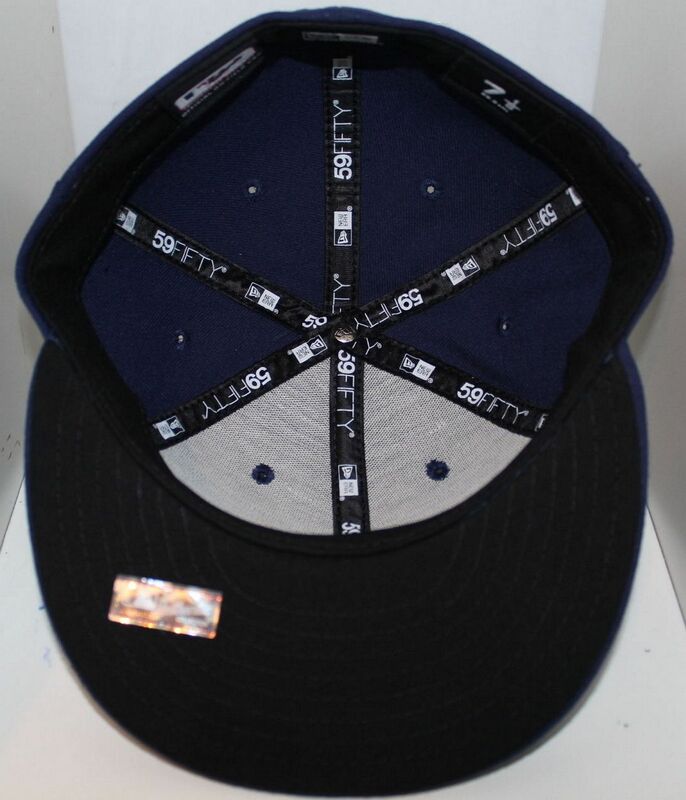 New Era made a number of these and sold them at retail. 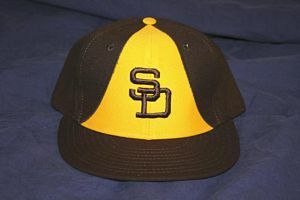 Nice style, I like it better than the mustard front. With a move to somewhat more traditional jerseys the Padres drop the Taco Bell front panels. 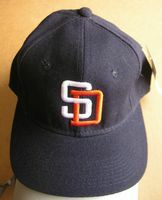 The team changes colorway to blue and orange and redesigns jerseys and caps. 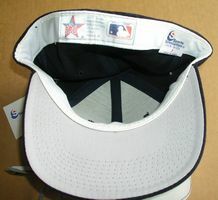 Undervisors go grey. 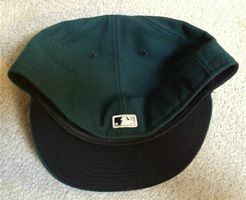 Sports Specialties caps are worn in the early 1990's. 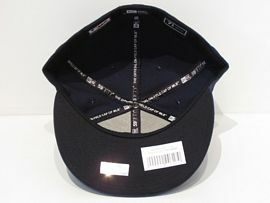 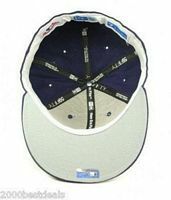 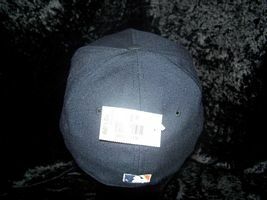 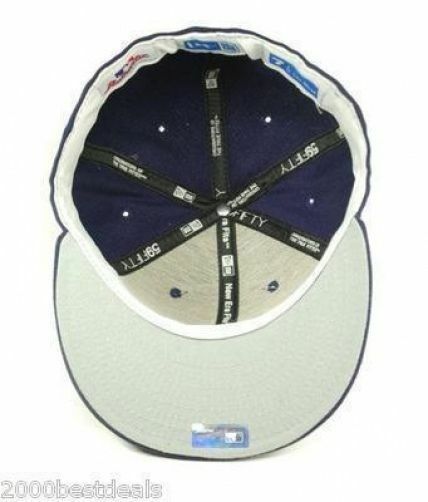 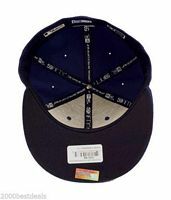 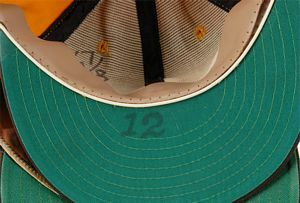 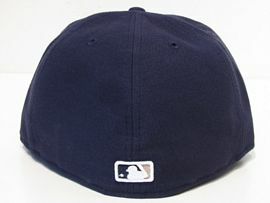 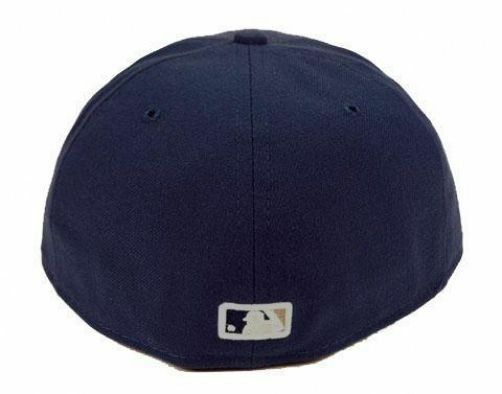 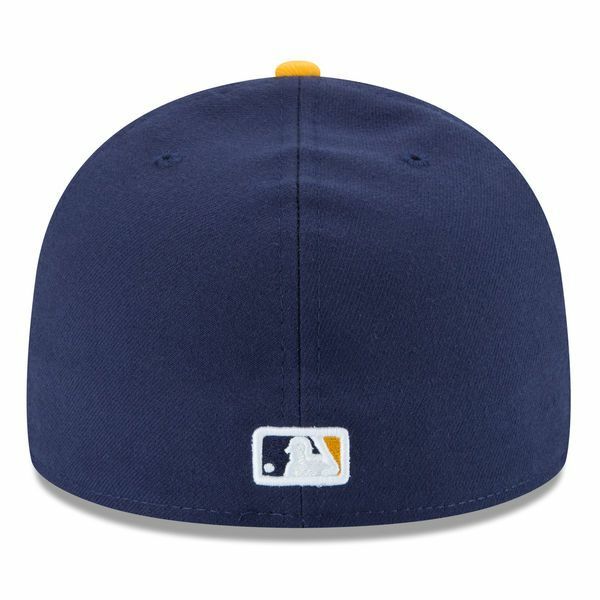 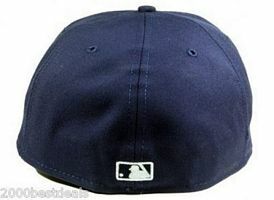 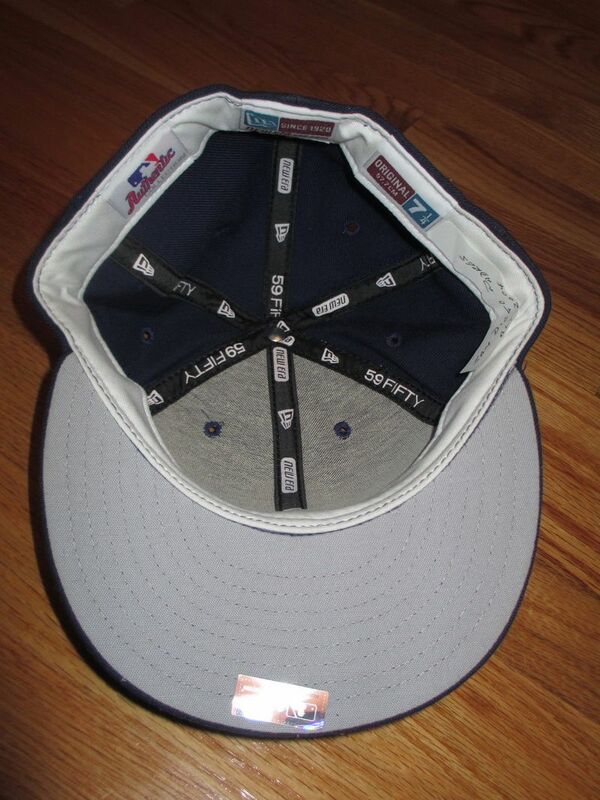 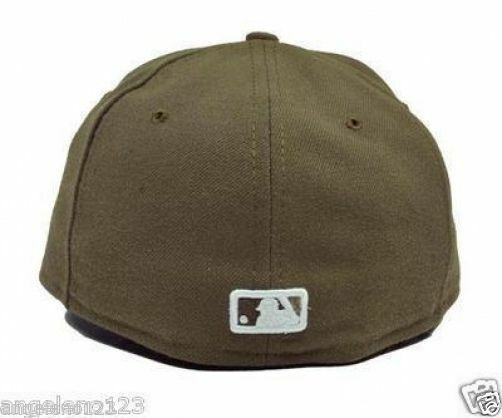 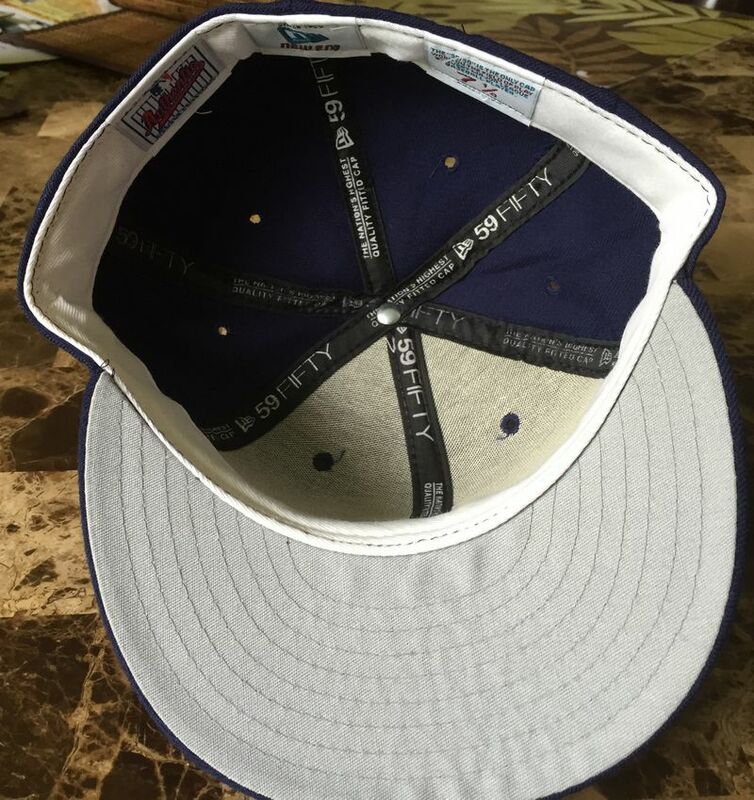 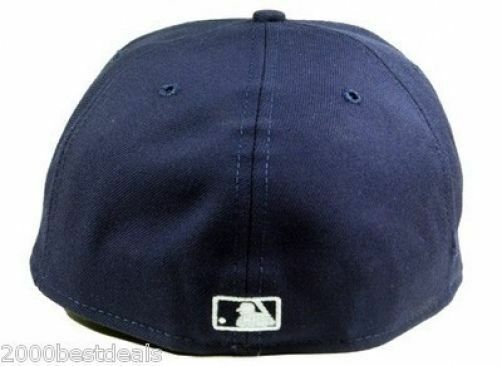 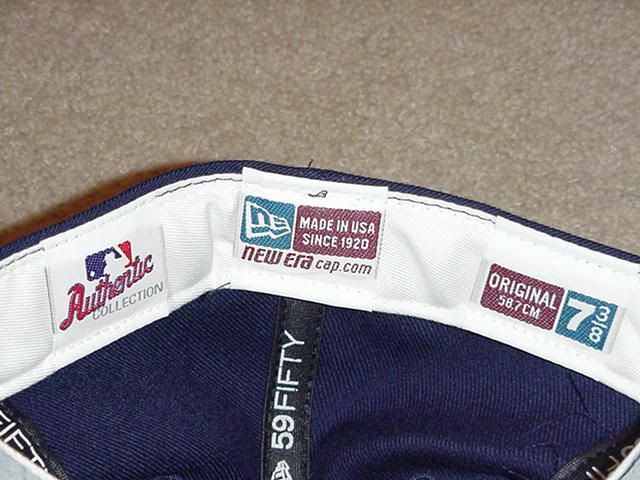 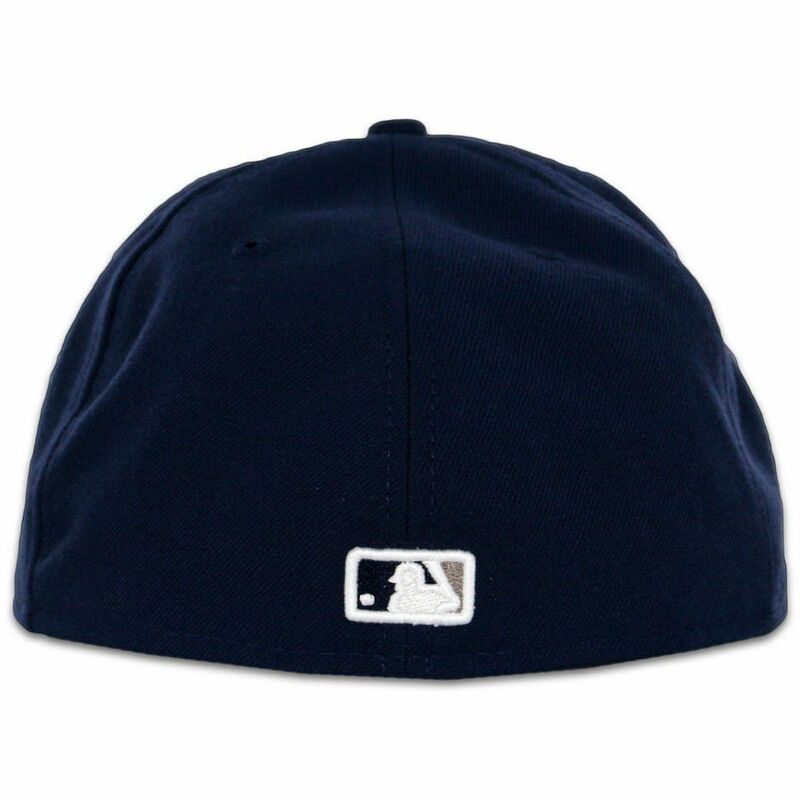 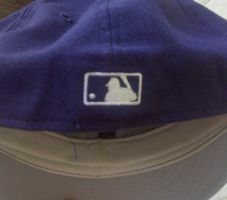 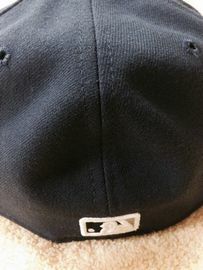 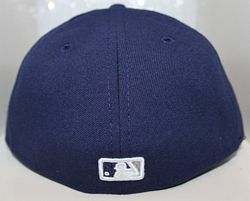 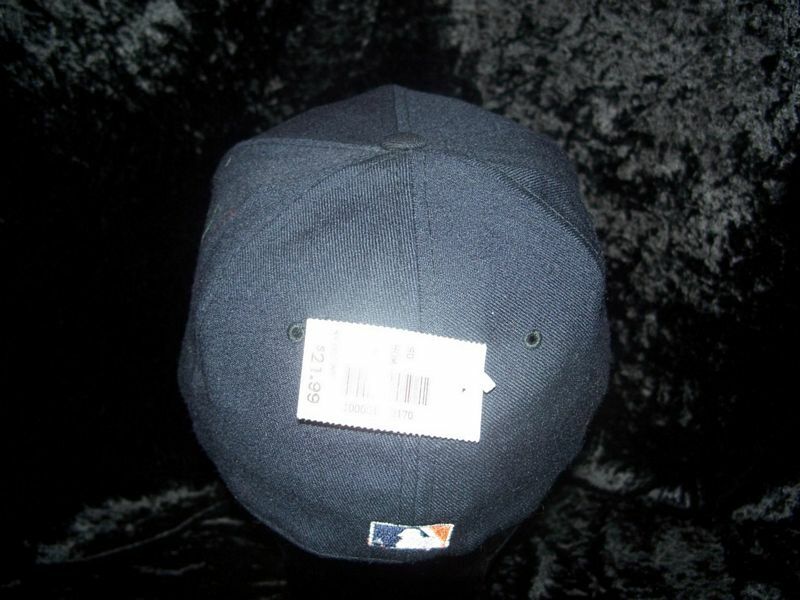 In 1992 MLB logos are initially glued on cap backs, and are embroidered later on in the season. In 1998 an alternate blue cap with all white logo debuts for use with the new all-white alternate home jersey. Button changed from white to blue on the alternate cap. 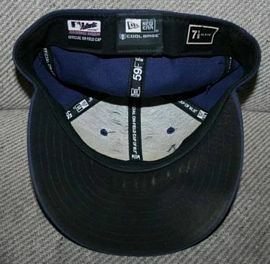 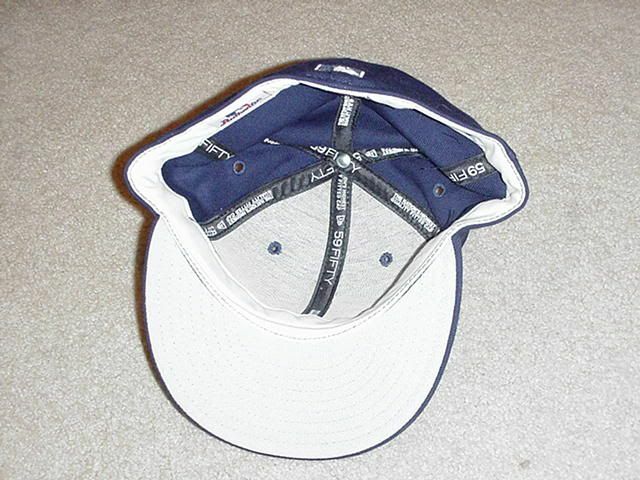 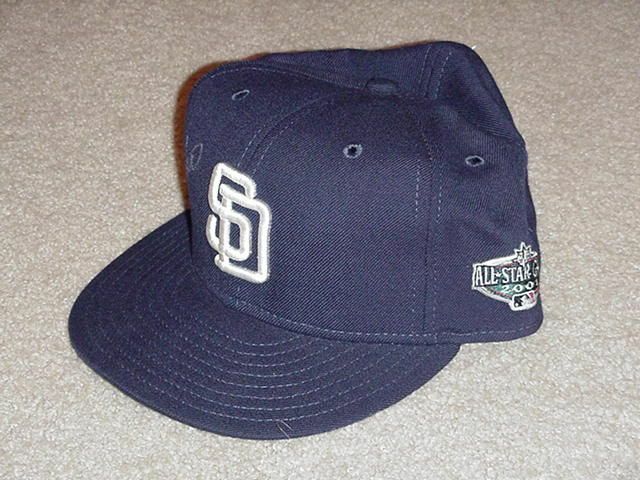 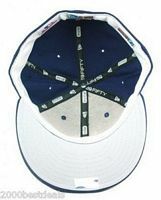 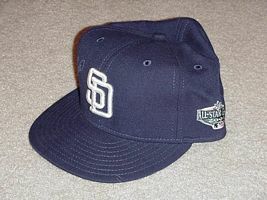 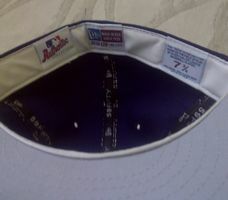 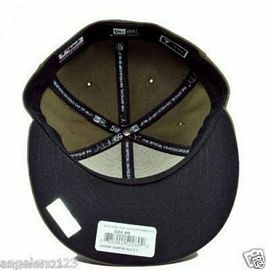 During 2001 the alternate cap becomes the home cap. The "white S orange D" cap is now the road/alternate cap. 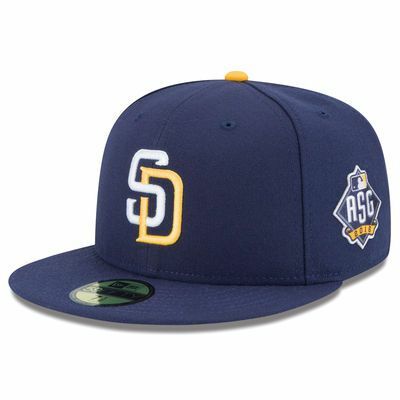 The team redesigns its look. 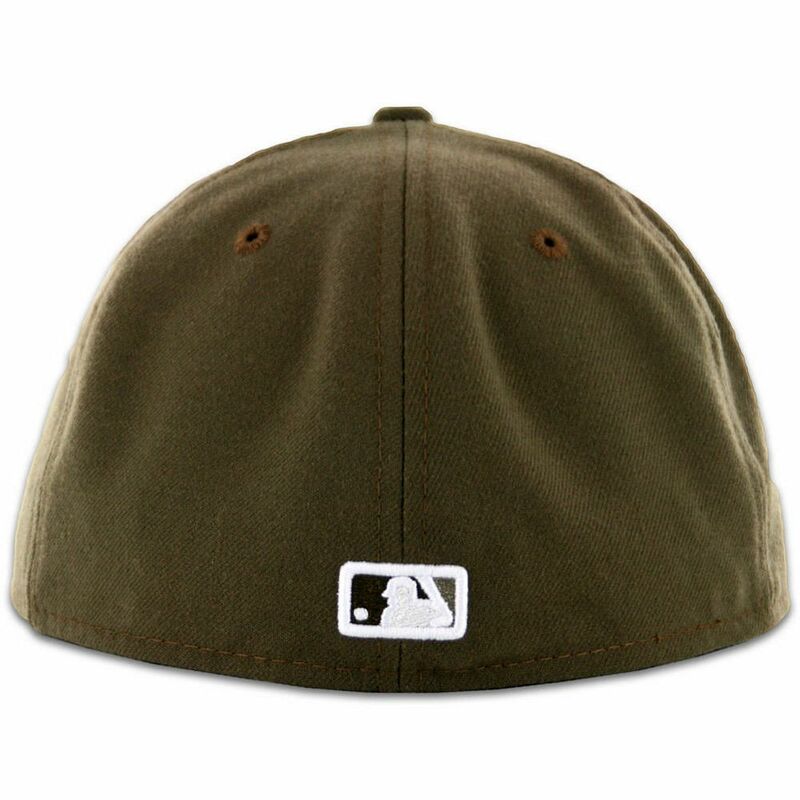 Green camo cap debuts along with polyester caps with black undervisors. 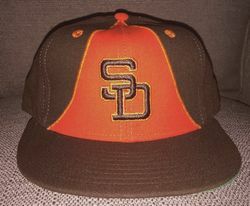 A brown camo alternate replaces the green version. 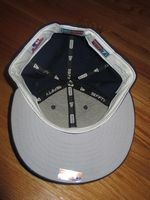 The road cap becomes an alternate only. 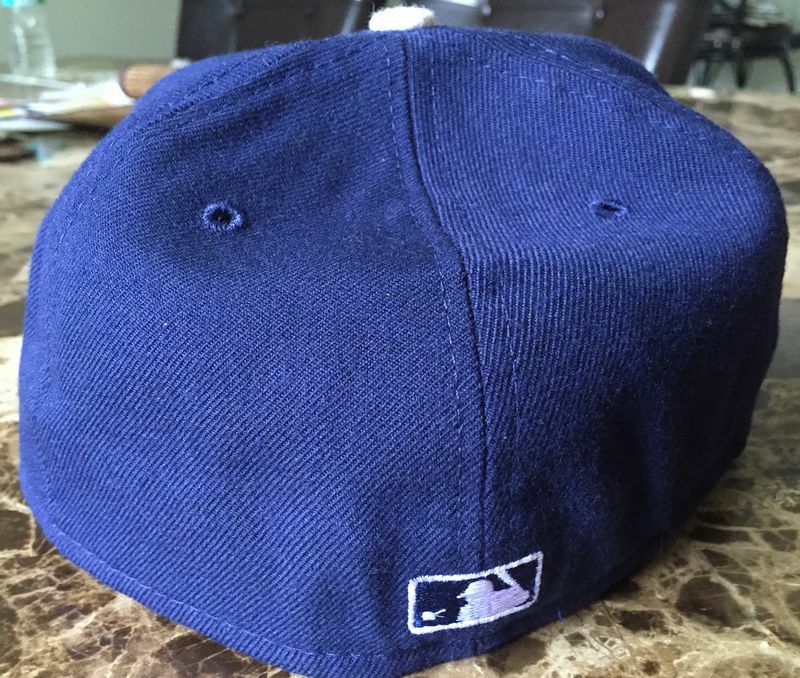 The former road-turned-alternate cap is dropped. New cap for the retro home alternate added. New cap with orange "D" for the new home jersey, new taco bell cap for the new Friday alternate. 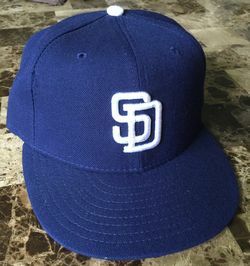 Blue cap with all white "SD" now worn only with road jerseys and a a new camo jersey.